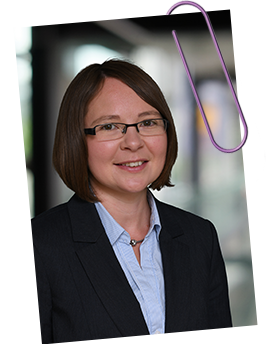 I am an English native speaker and provide competent and precise specialist legal translations from German into English for commercial law lawyers. I work both with law firms and with the legal departments of German companies. To see my focus areas, please click here. Short on time? Click here to go straight to my contact details. Lawyers need competent and precise translations delivered on time. These translations must be reliably consistent and accurate to enable them to meet the high demands of their clients. They don't want to have to factor in valuable time to rework substandard translations. This is why my clients receive careful and precise translations within the agreed timeframe. I want my clients to be able to concentrate on what they do best - legal advice - and I can help them to do this by being a partner they can rely on for the specialist language services which their work with international clients necessarily involves. Law is an extremely complex field. As such it is impossible even for companies with the most experienced directors to be familiar with all areas. It is even more difficult when the language of the legal system is a foreign one. Good lawyers practising in the jurisdiction concerned are naturally absolutely essential. In many cases, especially in Germany, lawyers generally also speak and write very good English. However, it is not only about your client being understood by you and understanding your advice. What I aim to do is to make the German legal system more transparent for your clients by providing them with specialist translations of all German documents into English. I work at the interface between language and the law and it is of central importance to me that your clients can find their way in what can feel like a mind-boggling jungle when not only the legal system but also the language is foreign. I help them to do this by ensuring that they can always read all relevant legal documents themselves – in their own native language. Testimonials are available in German on my German website. 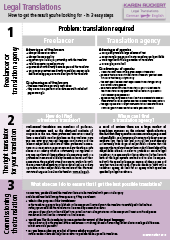 I have written a short guide to commissioning legal translations for my clients entitled Legal Translations - How to get the results you're looking for - in 3 easy steps. This guide is now also available to visitors to my website. Clicking on the image will open a PDF file in a new window or can be downloaded as per your settings.